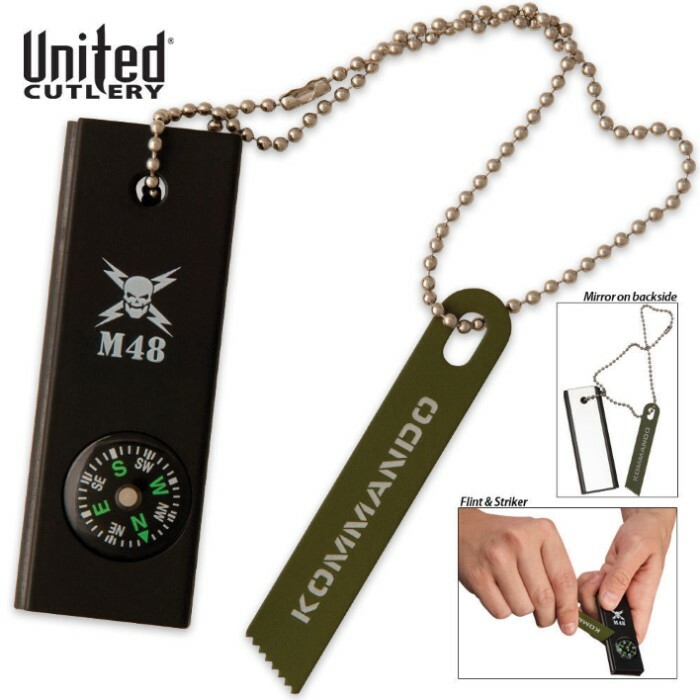 M48 Kommando 3-In-1 Survival Tool | BUDK.com - Knives & Swords At The Lowest Prices! When you are trying to survive, no other brand has your back like United®?s M48 Kommando! This reliable three-in-one tool features a 3” magnesium flint with a 2 3/4” steel striker that is serrated at the end. This tool also features a mirror on one side and a compass so you will always know what direction you are headed. Easy to pack and carry, this survival tool comes on a chain so that it is an always-available travel companion! Good price for a chance of - getting your general direction, signaling for help, making fire. this item is low dollar, compass is good enough for heading,not accuracy. mag stick is thin -(limited #of strikes), the mirror is great, it'll do the job! LEARN YOUR TINDERS! 5 bucks is a great price for this CHANCE of survival. 1 is never enough!!! The magnesium fire starter is top notch and works easily and quickly if you have used these before. Use a cotton ball with some Vaseline and you have a great start to a campfire or cooking fire. The compass is okay if you hold it perfectly still and take a general bearing. The compass is not for exact land navigation but, it will get you off in the right direction. The mirror is perfect. I cover it with a film of plastic and tape so it stays shiny until needed. Overall, M48 Kommando 3-In-1 Survival Tool is the best product for the money. The Kommando 3-In-1 Survival Tool is a perfect addition to your camping supplies and great for teaching the kids the basics of outdoor life. Well I bought two of these, one for me and one for a friend. While his is working great, mine broke the second day. I was still having trouble getting it to give me a big spark when the magnesium strip fell off and smashed on the gravel driveway. The mirror on mine also came pre-scratched. Gonna try sending mine back, hopefully my friend continues to have better luck than I have. Oh and the compass does work, but requires you to be VERY level, tough to do in your hand. Excellent survival tool, I bought this and the other M48 3 in 1 combo tool from BudK. The tool is a bit smaller than I thought it would be but it makes it easily portable. The compass works fine, and the mirror reflects good, the only thing I dont like is the chain it comes with is too short. I had a hard time trying to strike a spark. I had to take the striker off to be able to make a good spark. The other M48 3 in 1 has a longer chain so why doesnt this one?